Can't decide which Savannah Bee Whipped Honey is your favorite? No problem. Our Whipped Honey Sample Set feature one of each 3oz from our line of Whipped Honey: Original, Cinnamon, Lemon, and Chocolate. The Savannah Bee Whipped Honey line is all about pure and natural flavor! These great Whipped Honey Sample Sets feature four tantalizing varieties. 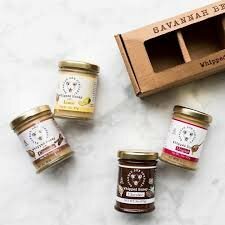 Savannah Bee whipped honey flavors include Chocolate, Cinnamon, Lemon, and Original, also known as Winter White. All four of these honeys have been whipped to a delightful and spreadable consistency. Spread on some love with a Savannah Bee Whipped Honey Sample Set. All whipped honey varieties are 100% pure and natural. They use pure raw honey and all natural flavors to create their whipped honey varieties. No Savannah Bee products include any artificial flavors or colors. Sample nature's most delicious treat! Stir this honey into coffee, hot toddies or other warm beverages for that extra "Zing!" 100% Pure Raw Honey and all Natural Flavors. Nothing artificial. Ever. If you have any questions about this product by The Savannah Bee Company, contact us by completing and submitting the form below. If you are looking for a specif part number, please include it with your message.